Step 1 In a small bowl, mix together the salt, garlic powder, onion powder and pepper. Step 2 Place the chicken, breast side down, on a cutting board. Using poultry shears or a sharp knife, cut along each side of the backbone and remove it. Open the chicken like a book. Using a sharp knife, make a half-inch-deep incision between the breasts and flatten the chicken as much as possible. For even cooking, make a half-inch-deep incision in each joint between the drumsticks and thighs. Remove and discard the wing tips. Step 3Season the chicken all over with the rub. Step 4Place the chicken, skin side down, over indirect high heat. Lightly coat the bottom of a baking sheet with the oil. Place the baking sheet on top of the chicken and weight it down with bricks wrapped in foil (or a cast-iron pan). Grill until golden brown on the edges, 30 to 35 minutes. Step 5Using pot holders, carefully remove the hot bricks and the baking sheet. 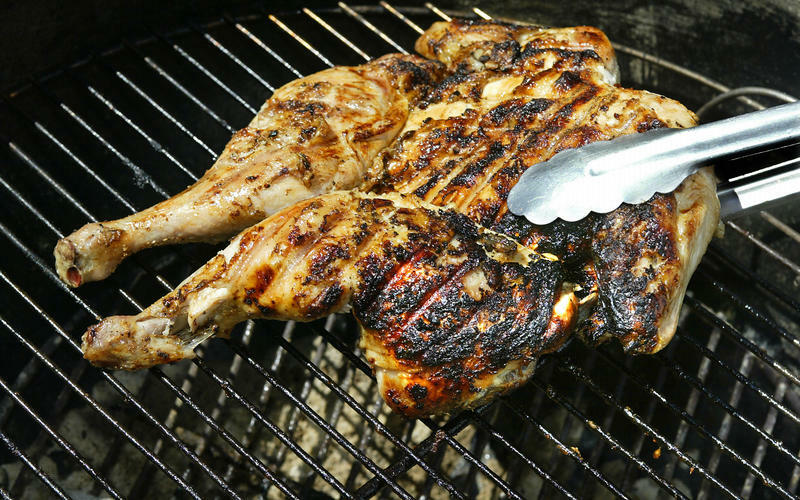 Using a wide spatula, carefully release the chicken from the grate, being careful not to tear the skin, move it over direct medium heat and grill for 5 minutes, then turn and grill an additional 5 minutes. Transfer the chicken to a platter and let it rest for 5 minutes before serving. Cut the chicken into serving pieces. Serve warm with the barbecue sauce. In Recipes-list.com we have selected the most viewed recipes from category - Grilled Main courses . Enjoy the best recipes specially selected for you! Chicken under bricks is the right choice that will satisfy all your claims.